In a word, this is brutal. Currently, online video is very slippery. Contrast the above results with the shelf life of a well written document or blog post and the results are the polar opposite. Documents and blogs accumulate links gradually over time and slowly but surely rise up the ranks of the Google. 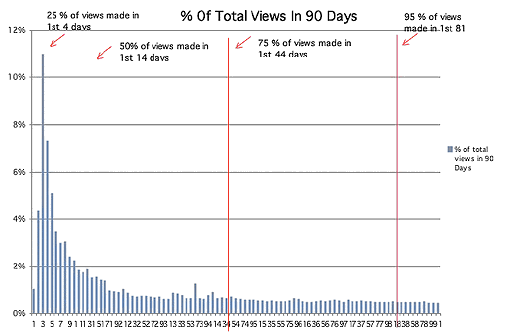 Documents and blog posts get more and more viewers over time, while video goes out of style faster than MC Hammer. Is adding a bunch of links the answer in increasing video longevity? Well, it’s part of the answer. But if you want really sticky video – that viewers keep coming back to – it’s best to emulate the masters. Facebook, for one, knows how to get viewers hanging out for ages (users’ average time on the site is over 17 minutes per session) and returning frequently. Every time anyone ‘likes’ a post on Facebook, the poster is notified. Typically, the poster will return to Facebook to see who did the liking and what they liked. So how does one get popular and accumulate likes? Simple: post something interesting, say something funny, or be a taste-maker. Throughout the process of getting popular, viewers return to Facebook multiple times. People desperately want to know what others are doing, how they feel, and what they like. Facebook has proven this. People are also very willing to share. The second reason Facebook is so sticky is that it’s constantly changing and everyone wants to see what’s new with their social circle. So how can you incorporate the above lessons into online video? How do you add lots of links, the ability to see what your friends are up to, and the opportunity for people to become experts and get popular? How do you get Sticky? One way is to incorporate LeanIn to your online video strategy. LeanIn installs in minutes and turns your video into a social experience. Viewers can easily publish from anywhere in your video stream to both Twitter and Facebook. Viewers can also see what their friends have been watching and what they have been ‘liking’. Finally viewers are motivated to leave in-stream comments in an attempt to become experts or taste-makers. They can do all of this with their existing social network credentials from Facebook or Twitter. For more information or to request a demo, go to www.leanin.com.